A grey platform with a red wheel in the center. Causes objects or platforms in the level to rotate/spin. 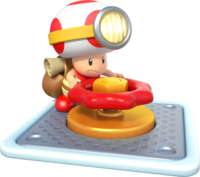 Spinwheels are objects that appear throughout Captain Toad: Treasure Tracker. They appear in certain levels, such as Spinwheel Library and Spinwheel Bullet Bill Base. To use the Spinwheels, the player must first stand on them, which will cause a large wheel to appear on the Wii U GamePad. This will allow the player to use the Spinwheel by rotating the stylus in a circle on the GamePad to rotate portions of a stage. The object that the wheel rotates varies from a small portion of the level to a large section of the level. The portions of the level affected by the Spinwheel will always readjust themselves to make sure the ends are connected to platforms. This page was last edited on July 14, 2018, at 17:17.